It is unusual to think of an artist as contemporary, of our own moment, years after her death. Even more unusual is a museum exhibition that focuses on work made in art school and as the artist was just beginning to develop a practice. 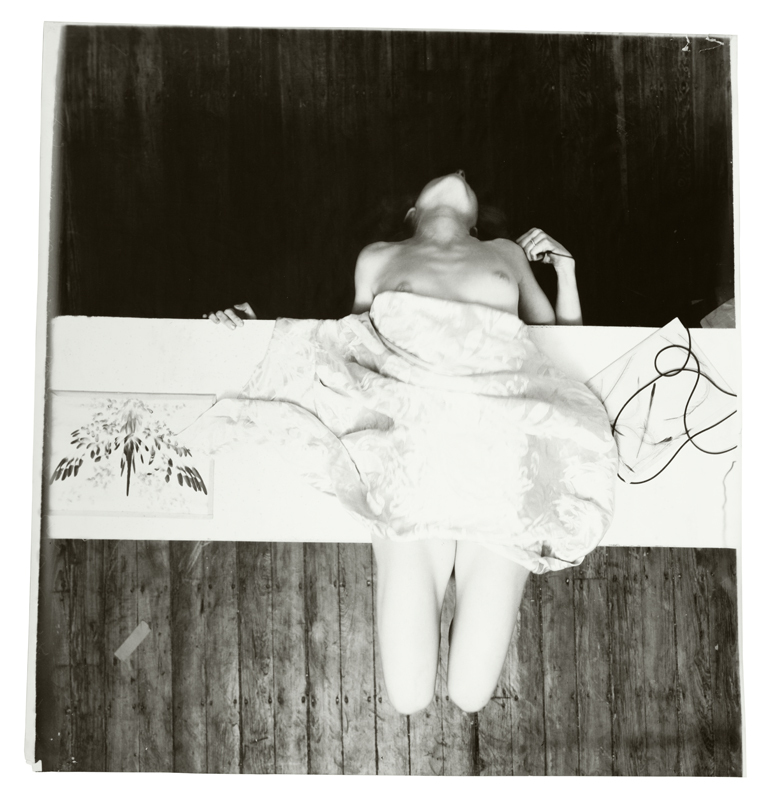 SFMOMA’s retrospective Francesca Woodman, organized by Corey Keller, does both. Woodman’s work seems to touch a nerve in almost everyone who looks at it; many viewers connect the strong emotional content of the work to her suicide at age 22. But to me this emotion is also (and maybe more importantly) connected to the raw expression of a self — at age 18, 19, or 20 — that is still being formed. While assisting Corey on the exhibition, I came to feel an unexpectedly intimate connection to Woodman, perhaps accentuated by the fact that she is no longer here to speak for herself. My role in the project included researching and cataloging images, facilitating loans, proofing the exhibition catalogue, and generating labels, among many other things. All of these tasks required carefully studying each image in the show, over and over again, to the point where I could recognize the notoriously chameleon-like Woodman in a self-portrait not only by the dresses, jewelry, and Chinese slippers she wore, but even by the freckles on her right hand. Beyond the physical, the sense of recognition extends to the potent, youthful energy that fueled Woodman’s art-making and — by the accounts of her friends, family, and teachers — defined her as a person. That this energy is palpable and familiar to me is, I think, in large part because I’m not too much older now than Woodman was when she made this work. Woodman the artist is, in many ways, still a mystery to me. But I so clearly recognize Francesca: a young woman grappling with the complexities of who she was and how she wanted to be perceived. (Not to mention the odd coincidence that both our mothers are named Betty.) Also coincidentally, but aptly, this is the first museum-scale exhibition I have worked on from its inception though its completion. The longer and closer I look at Woodman’s work, the more I find my own naïveté, ambition, and idealism mirrored there. Woodman’s best-known photographs were made while she was an undergraduate fine art student at the Rhode Island School of Design (RISD), from 1975 to 1978. Woodman entered RISD at or above the level of most young artists entering master of fine art programs — with a strong vision and a solid technical mastery of her medium. Even at age 18, she quickly distinguished herself as a student pushing the confines of assignment-based work and resisting pedagogy. In the mid-1970s, art schools were just beginning to encourage students to work fluidly between many mediums, a notion that is now commonplace. This ethos suited Woodman well; she was deeply engaged with photography but also loved literature and music, sometimes pairing poetic phrases with images and likening her method to that of a composer, creating variations on a theme within series of images. Although she was resistant to her student status, Woodman was clearly influenced by and immersed in RISD as a creative environment and community of artists. 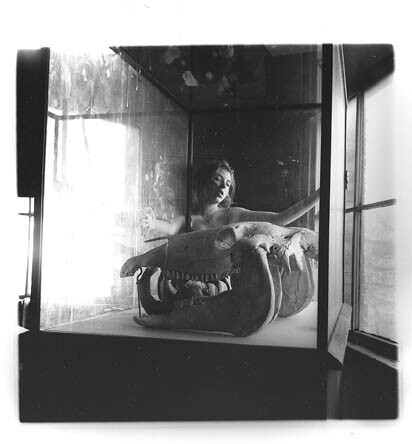 In one photograph, Woodman makes use of RISD’s Nature Lab, a trove of taxidermied animals into which Woodman physically inserts herself, creating a signature playful-yet-sinister tableau. Several photographs use glass cases and other specimens — meant for helping students learn to draw different kinds of surfaces — as frames for her own strange artistic experiments. The video excerpts in the exhibition illuminate Woodman’s working method; she was often not alone in the studio, sometimes employing friends and fellow students to push the button on her camera or act as models. 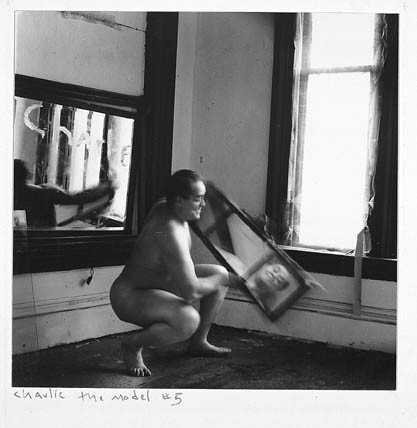 The series Charlie the Model features a man who posed for life drawing classes at RISD at play with the invisible Francesca in her studio. Looking closely, we see that Woodman has caught Charlie in mid-laugh with his name written in lipstick on a mirror in the background. This work is inflected with the bold playfulness and experimental approach that we associate with young artists. Yet for Woodman, these qualities are complemented by a remarkably mature vision. She combined her love of all things antique, like dilapidated architecture and the Victorian hairstyle she usually wore, with a surrealist sensibility. Perhaps without knowing it, Woodman coined an artistic style — one that appears as a visual expression of an interior state, and which resonates deeply with young artists today. Woodman has long been a favorite of art students, particularly women. It seems that younger viewers intuitively understand the work. In talking to art students, who are themselves in an experimental and vulnerable stage, I find that they recognize in Woodman’s work a sincerity that can’t be impersonated, something very real that they identify with. This reminds me of my own experience in art school, at California College of the Arts (CCA), where I studied curatorial practice alongside incredibly talented young artists working toward their MFA degrees. Working alongside artists at this stage in their careers was invaluable to my understanding of how art education and artist communities push individuals to take risks and think beyond themselves. I also came to understand the tremendous value of talking to artists as they develop ideas and try things on. Like RISD, CCA encourages students to work fluidly between mediums, emphasizing conceptual depth over permanent attachment to a singular working mode. Both in reaction to and, sometimes, in tandem with this ethos, many MFA students have recently turned away from technological innovation in favor of a handcrafted, DIY aesthetic. Many artists have revisited antiquated mediums and analogue processes (letterpress, tintypes and photograms, Super 8 film) as a way of reclaiming craft in fine art. It’s not only about materials and aesthetics, but about a collective yearning for authenticity in art-making. This sense of making art outside the constraints of one’s moment in time, in search of a deeper personal truth, resonates with the style and personality of Francesca Woodman’s work. This exhibition is distinctive not only in featuring a young, experimental artist but in appealing to a similarly young, creative audience. Despite the tragic brevity of Francesca Woodman’s career, we now have the opportunity to engage with her work through extended, repeated viewing. This retrospective represents a period of only six years — a blip in the long view of history, but a period bursting with creativity for Woodman. What we see today is the vision of a young artist perpetually in development, forever fixed at a transitional, emergent moment in her career. Watching visitors move through the exhibition, I notice how close people get to each of the small gelatin silver prints; the objects’ size requires and rewards viewing at the most intimate range. The longer one looks, the more each detail reveals itself. This is true of studying Woodman’s oeuvre, as well; although she will always remain an enigma to some extent, with so many questions unanswered, the depth and complexity of the work reveals itself over time. Its meanings and impact astonish me, bit by bit, and the artist and woman merge in my mind into one remarkable Francesca Woodman. Jessica Brier is Photography Department assistant at SFMOMA. She is also an independent curator and a contributing writer for Art Practical. Our One on One series features artists, writers, poets, curators, and others, responding to works in SFMOMA’s collection. You can follow the series here. What an insightful, personal observation from an exhibition curator. Gallery goers so often just see the works on the wall or read an academic essay in the catalog. Your comments have enriched my experience of seeing these extraordinary photographs. Thanks! I recently discovered Francesca Woodman’s work.One on the things that drew me to her work was that I am just 2 years younger than her and was also just discovering photography in high during those same years–1975-78.It intrigues me now to think that while I was getting immersed in the art of photography in Northern California she was creating these wonderful images across the country.Wish we had somehow known of each other at the time.There were some really talented people in my photo class,and also some doing rather generic average work.We were just around 16 after all.I fancied myself to be pretty talented,I took what I thought were some pretty good photos,but they were nothing compared to hers.For senior year we had the project of doing a photo-book with a theme.I chose Sisters and took portraits of several sets of sisters.I thought they were pretty good,but they really were just standard straight ‘posed’ type portraits,compared to her work,pretty boring. Now that I see her work I wish I had been more experimental in my photography in high school.Just done more unusual things–her stuff just is so…interesting.I wish I had gotten more creative with my camera,done more self portraits,just gone out into the woods with my camera and let my imagination run free.I think I had the inclination toward her kind of style,moody,dreamy ethereal—if I had just taken the time and gone to that place and ‘broke out of the box’ a bit more.I just really like her style,love the nudes and self-portraits.